A recent blog post moaned about a layout that I was getting nowhere on. Well, it’s gone off in a bit of a different directions, and I am happy to say has used a few things bought but languishing in my stash for ages, mixed with some fairly new items. 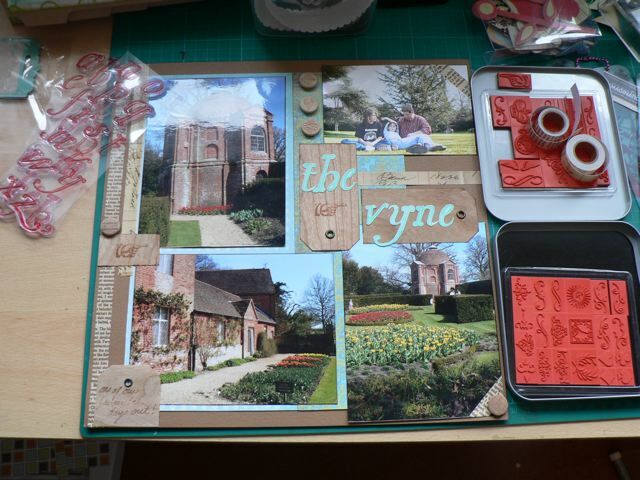 Just a layout using a few of the MANY photos we have taken at The Vyne, our local “stately home” and a firm favourite for a day out – it’s got lovely grounds, is surrounded by woods with walking trails, has a nice picnic area, is less than 10 minutes away, is free with our NT membership, and is fun in any weather. VersaMagic ink, from a Club Scrap kit, oh, maybe 8 years ago? I also managed some wodden buttons and wood tags (from a GoGo kit) and some fairly recent papers. 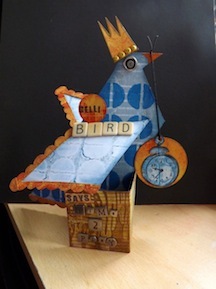 It’s not my best layout ever, although I do rather like it – and I like that although I fought for AGES with it, when I went back into the depths of my stash I found stuff that I liked and that made it work. Gotta love stash! Categories: Layouts, New from Old | Tags: Layouts, scrapbooking | Permalink.